Kotakoski, J., et al., Phys. Rev. Lett. 106 (2011), p. 105505. Kotakoski, J., et al., Phys. Rev. B. 83 (2011), p. 245420. Meyer, J. C., et al., Phys. Rev. Lett. 108 (2012),p. 196102. Eder, F., et al., Scientific Reports, in press (2014). Kotakoski, J., et al., submitted (2014). 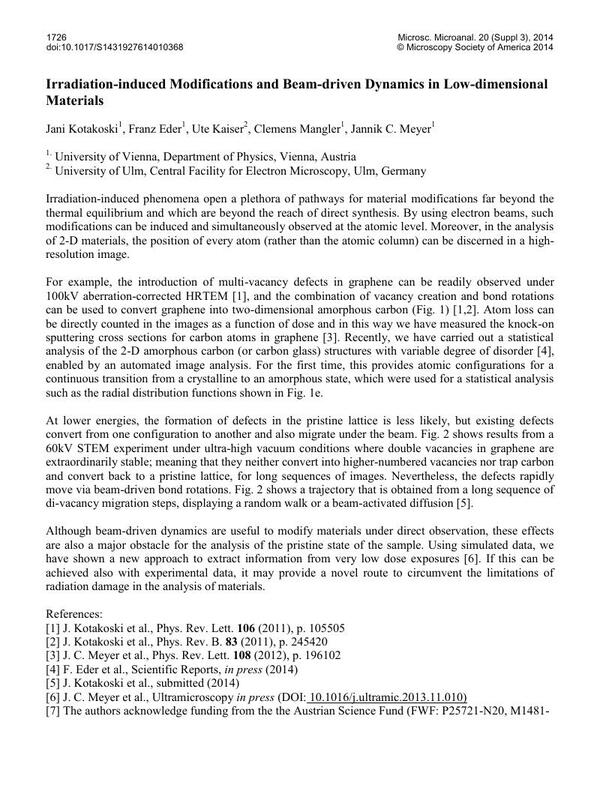 Meyer, J. C., et al., Ultramicroscopy in press (DOI: 10.1016/j.ultramic.2013.11.010). The authors acknowledge funding from the the Austrian Science Fund (FWF: P25721-N20, M1481-N20 and I1283-N20), the European Research Council (ERC) project PICOMAT, the German Ministry of Science (DFG), Research and the Arts (MWK) of the State of Baden-Wuertternberg within the SALVE (Sub-Angstrom Low-Voltage Electron microscopy) project, as well as computational time from the Vienna Scientific Cluster.